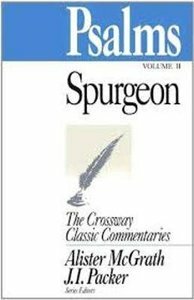 About "Psalms #02 (86-150) (Crossway Classic Commentaries Series)"
Charles Haddon Spurgeon is commonly called "The Prince of Preachers", a title he rightly deserves. At the height of his ministry he preached to crowds of ten thousand every Sunday. Now, a hundred years after his death, Spurgeon's sermons remain insightful, convicting, practical, and timely as when he preached them from the pulpit of the Metropolitan Tabernacle.